I was recently in Belgium for a holiday. My son has been studying World War 1 history at school so we decided to visit the locations around Ypres that featured in the war. 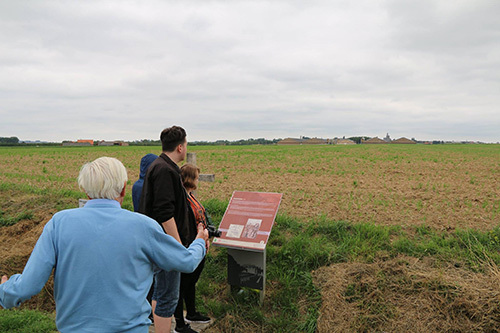 One site everyone was keen to see was the location of the Xmas day truce of 1914. By Christmas 1914, World War 1 was 4 months old. 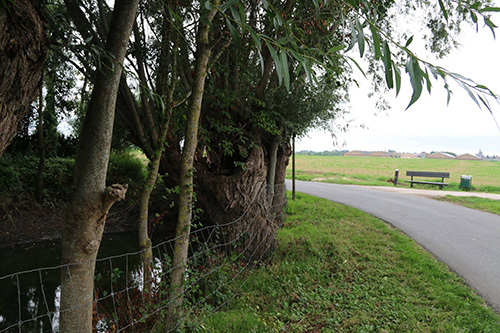 The front in Flanders around Ypres was pretty static with the race for the sea that established the salient at Ypres in the past and the great battle of Passchendaele in the future. That Christmas for the only time in the war a brief truce occured up and down the line. It did not occur everywhere and was definately not official but, in a few locations, tentative ceasefires were agreed formally or informally and soldiers emerged cautiously to search no-mans-land for the dead. In some places exchanges of conversation started up, food was passed around and then alcohol, carols were sung and then …somewhere… maybe in several places… someone got out a football! 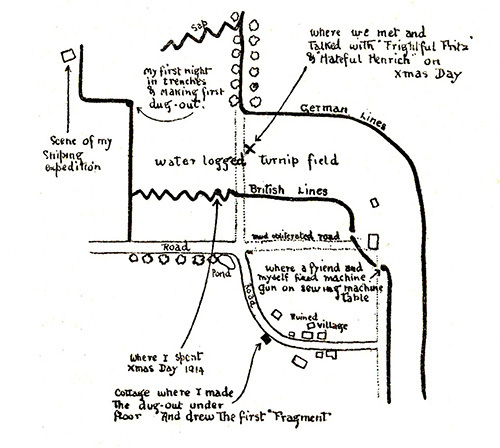 Bruce Bairnsfather’s map showing the turnip field where he met Germans on Christmas Day 1914. In one location near the vilage of St Yvon a certain (then) Seargent Bruce Bairnsfather of the Warwickshires was posted. He was injured not long after Christmas and took up drawing cartoons which in time became a definitive account of life in the trenches. He also drew a map of the exact location of the truce he was part of and recorded much of what went on. 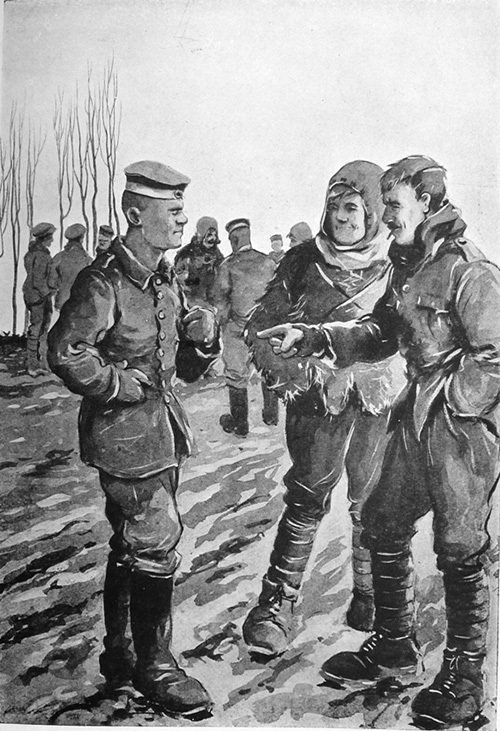 “Christmas morning I awoke very early, and emerged from my dug-out into the trench. It was a perfect day. A beautiful, cloudless blue sky. The ground hard and white, fading off towards the wood in a thin low-lying mist. It was such a day as is invariably depicted by artists on Christmas cards—the ideal Christmas Day of fiction. “Walking about the trench a little later, … we suddenly became aware of the fact that we were seeing a lot of evidences of Germans. Heads were bobbing about and showing over their parapet in a most reckless way, and, as we looked, this phenomenon became more and more pronounced. An incident from the truce recorded by the cartoonist. 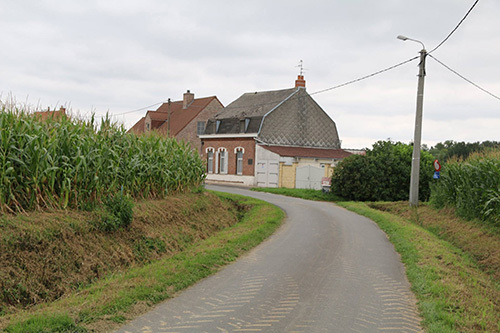 The turnip field where he met Germans on Christmas Day 1914. Bairnfather’s map is so accurate and detailed that it is easy with a good map to locate the spot where this all happened. Indeed today (unlike 10 years ago when I visited before) the spot is marked on google maps. This is the cottage built on the site of the original building where Bainfather lived. The same road exists as did in 1914 with a bend in it and on the bend is a cottage located exactly where the one where Bairnfather lived. The pond on the map still exists. The map recorded a pond and that is still there. 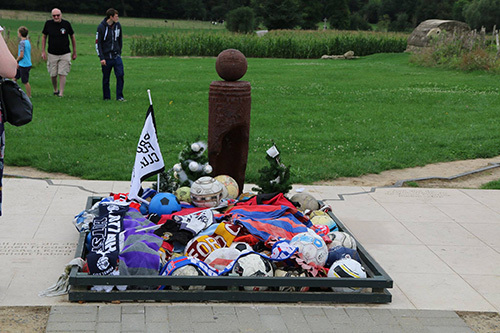 The UEFA monument to the Christmas Day football of 1914 at St Yvon. There is much debate as to actually where the football occured with various locations mentioned by various soldiers. 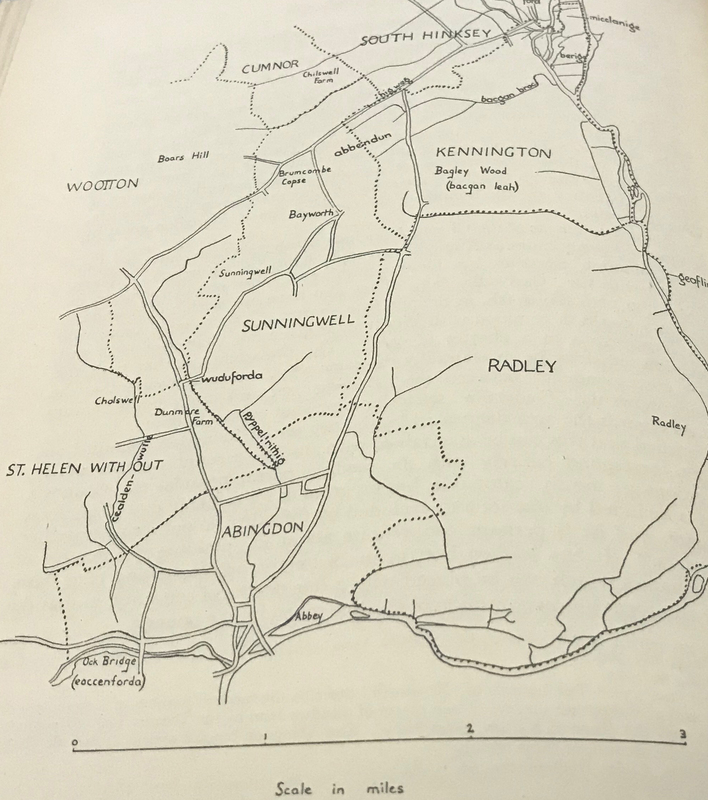 On his original map of the truce location, Bairnsfather did not mention football but later in interviews just before he died said they did occur here. 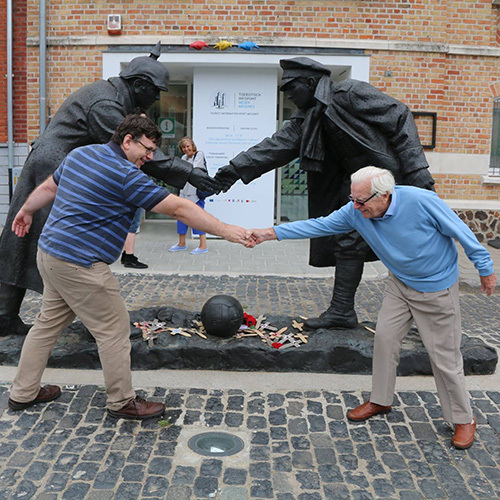 His maps give us a firm location of the truce so UEFA decided it was a fair choice for their memorial to the football that occured this day somewhere in the area. I recreate the incident with the help of my father. Near to the location of the truce is the town of Mesen that was occupied by the Germans for much of the period. Another memorial to the incident is located in the square there. 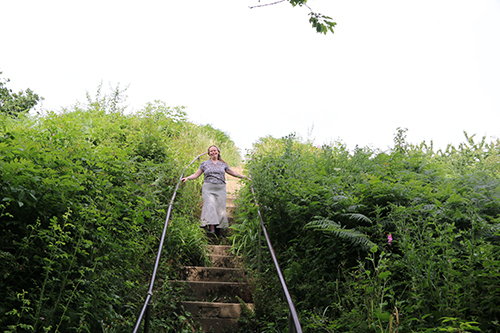 As we left the area we stopped briedly there and somehow this photo happened! In the summer of 2017 we spent our holidays in Ireland and staying near Dublin. One day we headed up into the Wicklow hills and visited Glendalough. 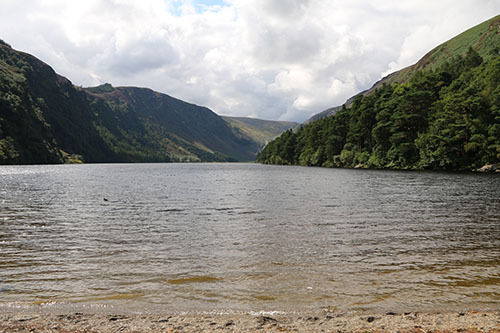 The name Glendalough comes from the Irish Gleann Dá Loch which means “Valley of two lakes.” It is a “does what it says on the tin” type of name as it is a glacial valley with an upper and lower lake. It is area of great natural beauty and at least before the pilgrims and later the tourists came would have been a very peaceful spot. Small wonder then that it is the site of an Early Medieval monastic settlement which was founded in the 6th century by St Kevin. The life of St Kevin is not well documented and in fact no records survive from his life time or even close to it. So as with many cases in this period we have to turn to the often unreliable saint’s life accounts. 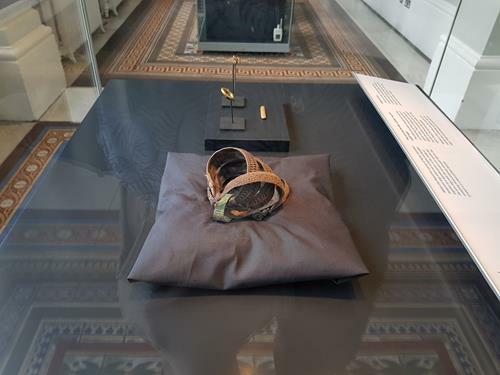 In the case of St Kevin there is a late medieval Latin Vita found in the records of the Franciscan Convent in Dublin. According to this account, Kevin’s name was Coemgen (anglicized to Kevin. He was of noble birth. He was the son of Coemlog of Leinster and was born (according to the tales) in 498 at the Fort of the White Fountain. The account also goes on to relate miracles and other events. One example was the legend that a white cow visited every morning and evening and supplied the milk for the baby. The upper lake at Glendalough and the site of St Kevin’s bed. 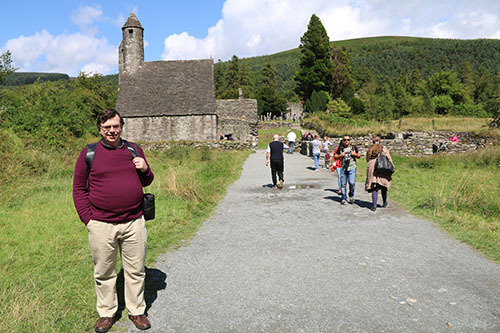 In time Kevin was ordained and according to the Vita was led by an angel to the remote location of the upper lake at Glendalough where he lived as a hermit in a cave (the cave is actually a former Bronze Age tomb which after Kevin’s time was known as St. Kevin’s Bed). Here, so the tales go, Kevin’s companions were the animals and birds. For seven years he live alone, sleeping on stones, wearing skins and eating little and praying. In time he began to attract followers who built the first monastery on the shores of the upper lake. Having established a thriving community, Kevin retired into solitude again in 544 but was persuaded to rejoin his followers by 550. The tales then say he presided over the monastery until his death in 618 at the extreme age of 120! Today Kevin is one of the patron saints of the diocese of Dublin. The monastery as seen from the visitor centre. 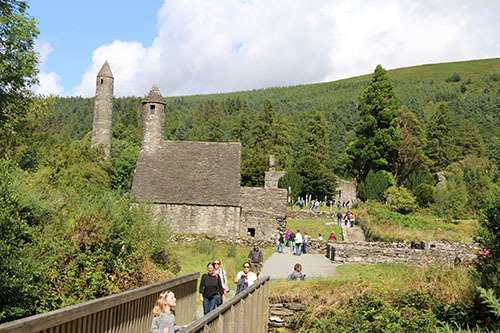 In the centuries after Kevin’s death, Glendalough became one of the main pilgrimage attractions of medieval Ireland. 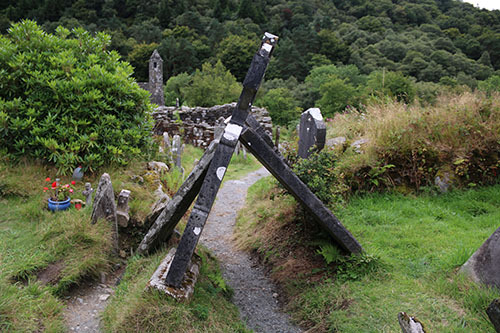 It was said that to be buried in Glendalough was as good as being buried in Rome. It was also the case that several trips there equated to the much longer pilgrimage to Rome. Thus many Kings and Queens and bishops were buried here. 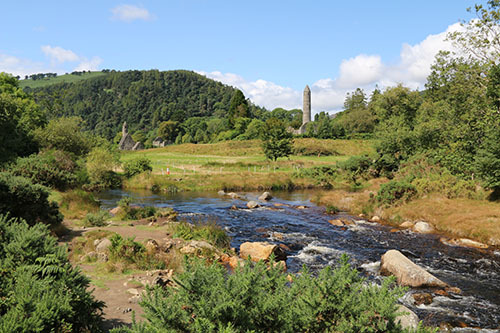 The golden age at Glendalough was between 1000 and 1150AD during the reigns of the Irish kings Muirchertach Ua Briain (of Munster), Diarmait mac Murchada (of Leinster) and Toirdelbach Ua Conchobair (of Connacht). The most famous abbot of Glendalough Lorcán Ua Tuathail (Laurence O’Toole) went on to be the first archbishop of Dublin. He died in 1180. These kings and bishops and others were involved in constructing the stone buildings that survive to the present day and which are there for the visitor to enjoy. 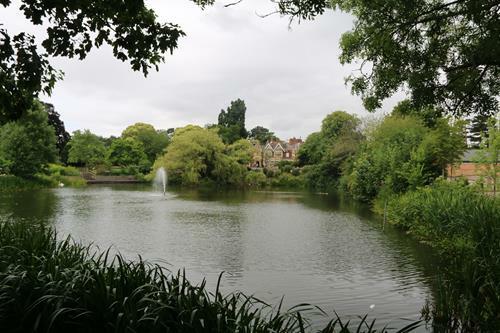 The site of the medieval period monastery was near the lower lake. 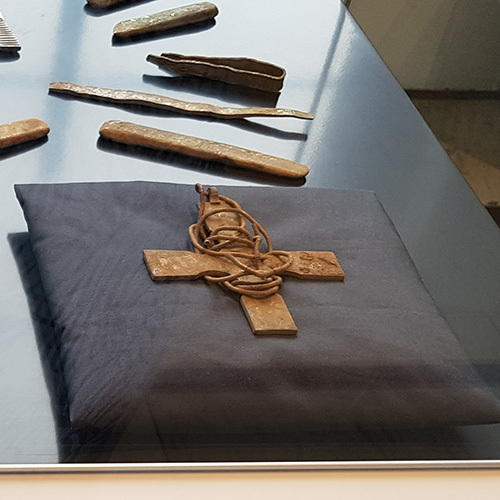 Today there is a visitor’s centre at the site which includes a small museum and videos of the history of the monastery. 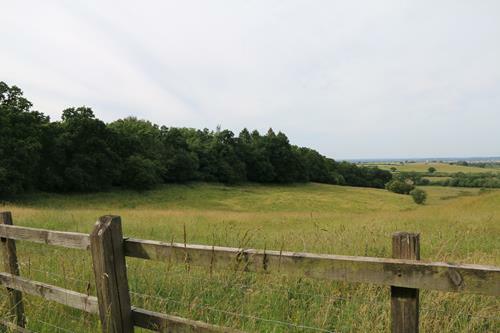 From the visitors centre it is a 5 minute walk over fairly easy ground to the site. We were lucky that after a day or two of rain the sun came out for our visit. Here you can see me posing with St Kevin’s chapel in the background. Inside the cathedral looking west. 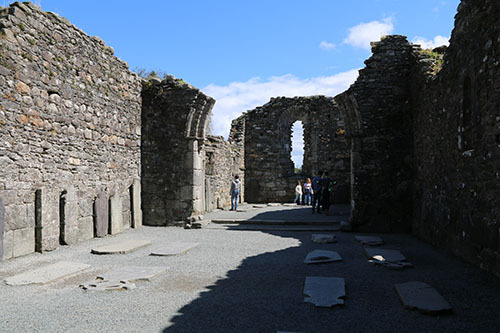 The largest building at Glendalough is the cathedral. The earliest parts of this actually come from an earlier church – the stones being reused in the west doorway seen above. The chancel and sacristy are later and date from the late 12th and early 13th centuries. The chancel arch can be seen above with the east window beyond. There are other smaller churches on the site including St Kevin’s chapel (above). 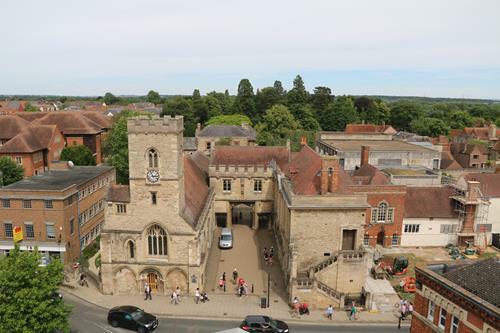 The church also has a belfry with a conical cap and four small windows at the west end of the roof that looks rather like a miniature round tower. 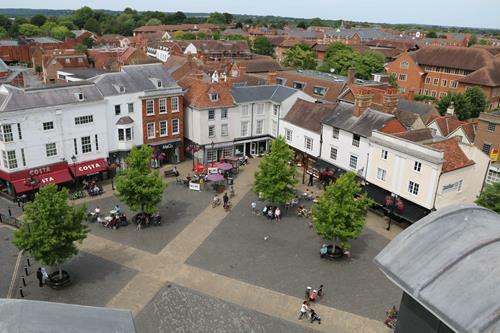 Apart from the churches and cathedral, the site has evidence of a number of buildings including a reconstructed ‘Priests’ House.’ It is not known what the original purpose of the building was – possibly housing relics. It gets its modern name from the practice of interring priests there in the 18th and 19th centuries. To me the jewel in the crown was the round tower at Glendalough. 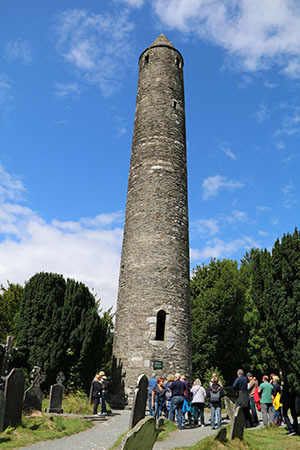 It is considered to be one of the most finely constructed and beautiful towers in Ireland. The tower is over 30m high (just under 100 feet). 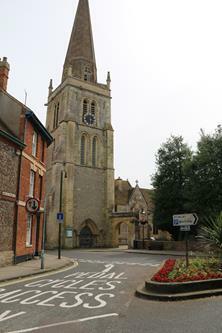 The body of the tower is original although the roof was rebuilt in 1876 using original stones. 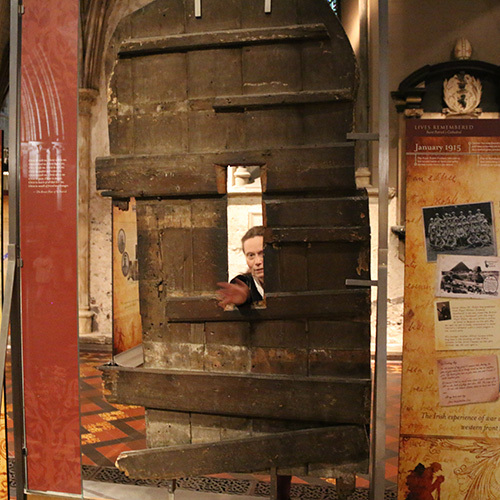 The tower has 6 timber floors, connected by ladders. The four storeys above the entrance feature a small window with the top having four windows. The door is about 3.5 meters or 10 feet from the ground. It is clearly designed for defence. Refuge seekers could retire inside then raise the ladder making it very hard to attack. The tower was built in the years after centuries of Viking raids so this was an sensible decision and wise precaution. 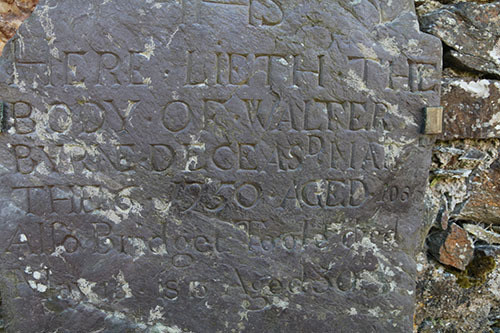 The site is now dotted with gravestones of varying age – many (as above) in a state of disrepair. One caught my eye. You may recall that St Kevin was supposed to have lived until the age of 120. That might seem far fetched and yet I found this below engraving recording the death in 1950 of a Walter Byrne aged 106! Maybe there is something in the air or water here. 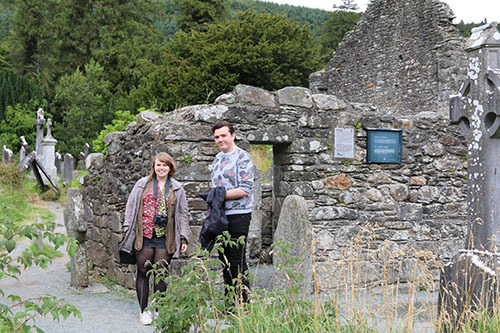 Glendalough was for centuries a centre of learning. The monks and scholars produced many manuscripts in Irish and Latin, including astronomical and mathematical texts and chronicles. One of the most famous manuscripts is the 12th century book of Glendalough which is now preserved in the Bodleian library in Oxford. 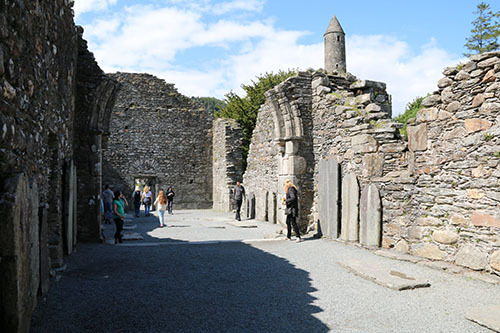 In 1214, the dioceses of Glendalough and Dublin were united which led to a decline in the cultural and ecclesiastical status of Glendalough. Finally in 1398 the valley was attacked by English forces and settlement destroyed which left the site a ruin although still seen as a place of pilgrimage. 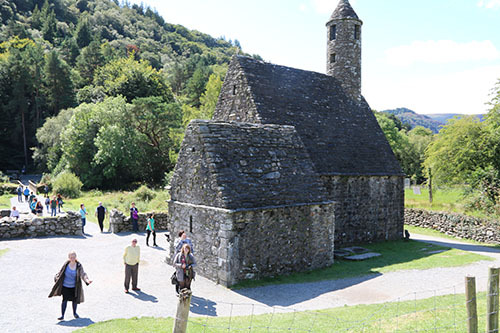 For more details on the Glendalough Visitor Centre click here. 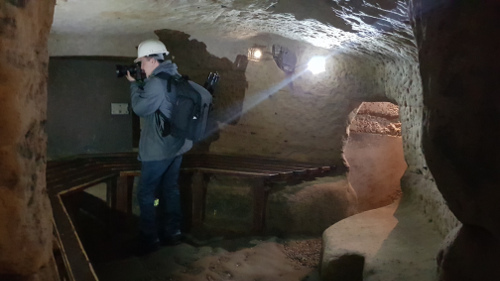 Many people are unaware that beneath the modern city of Nottingham are hundreds of caves, carved into the soft sandstone upon which the city stands. Yet it is the case that the city has a complex of over 500 caves. None of these caves are natural. They are all man made. It is impossible to say when the first caves were dug and for what purpose but it is believed that druids in pre Roman times carved out places of worship here. Later on the Romans may have used them as a crematorium as evidenced by Roman tiles found in a ventilation shaft. Many of these date back as far as the Dark Ages. More recent ones were used for industrial purposes and even as bomb shelters in the 1940s. 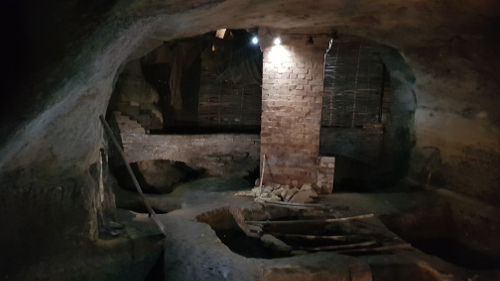 It is claimed that Nottingham has more man-made caves than anywhere in the UK and nowadays the cave network has Ancient Monument Protection status. 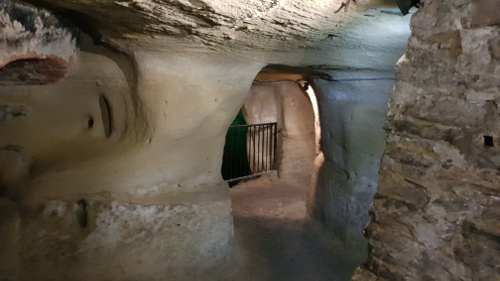 So significant a feature were the caves that one of the earliest descriptions of the city in The Life Of King Alfred, by Welsh monk and historian, Asser. Around the year 868, the monk was travelling to Lincoln and recorded in his diary; “…..this day passed Tigguacobauc.” This word, in his native Welsh tongue, probably meant ‘cavy house’, or ‘Place of Caves’. In the reign of Edward I one set of caves near the River Leen was developed into a chapel which was eventually gifted to the king. The caves played their part in history more than once. In the year 1330, Edward III used a cave to gain entrance to Nottingham castle where they captured Roger de Mortimer who at the time was the defacto ruler of England. Mortimer was taken away and later executed. After this time the tunnel was called Mortimer’s Hole. 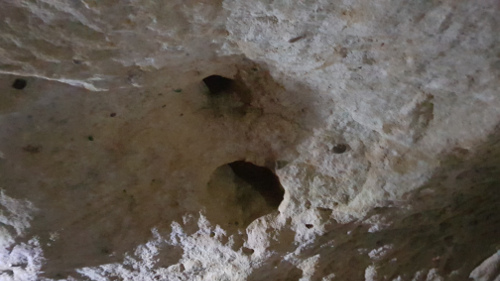 These ancient caves were eventually used by the poor for housing for centuries and certainly throughout the entire medieval period. Eventually this practice came to an end around 1845, when the St. Mary’s Enclosure Act made the rental of cellars and caves as homes illegal. Heading down into the caves you find areas where brickwork is replaced with the sandstone. In the caves you can find man made features such as a well leading down from higher up, through the caves and down further. 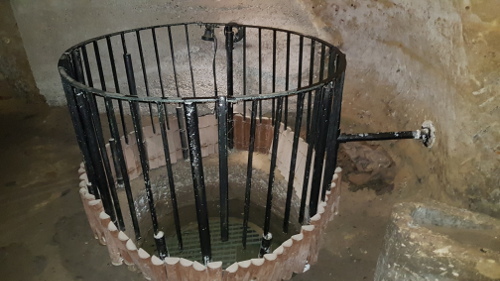 In this case you can actually look up through the original well shaft from the cave level towards the original street level as well as downwards from the cave and into the bedrock. In addition to wells the caves contain cess pits carved out of the bedrock. Thankfully the contents have long since been removed! Other caves contain underground tanneries where hides would be treated in beds filled with urine. This one is said to be the only tannery in Europe built in a cave. It would have been a very smelly place to go to work but it did have its benefits as the tanners rarely contracted the plague as neither the rats nor the flees that carried the plague endured the conditions. There is a cave once used as a tavern cellar. The ledges would be where the beer would be stored – off the ground. 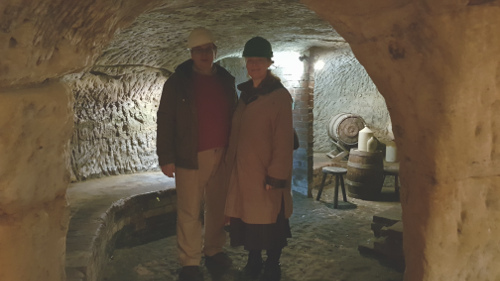 In recent times some pubs and even restaurants have started to use the cellars again. You can even dine in one of the caves. Some of the cellars were later used to house machinery during the industrial revolution. The Luddites objected to the machines which they saw a threat to the traditional labour force and so they sabotaged the machines in the year 1811 and the following few years. In Nottingham the machinery was sometimes in the caves and so they would sneak in and do their damage. Someone kept watch above ground and if the authorities turned up they would drop coins through small holes to warn those below to flee. It is possibly a source of the phrase “the penny has dropped”.. In the Second World War Nottingham was raided by the Luftwaffe and the city used the caves as shelters. Caves, many of which have been forgotten about for centuries continue to be found. 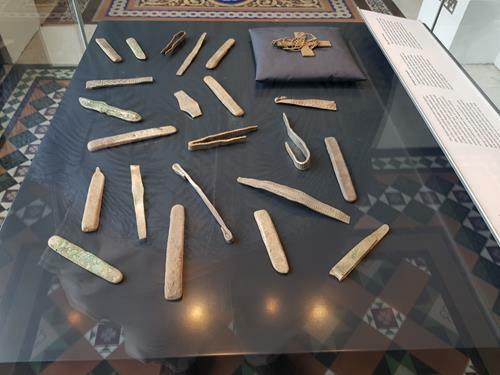 Indeed Nottingham council employs an archaeologist to find them and keep track of them all. 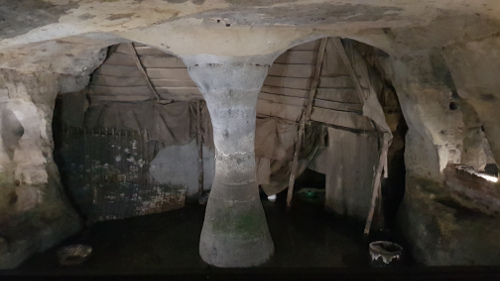 One complex of caves lies beneath Broadmarsh shopping centre which was built over the 19th century Narrow Marsh slums whose inhabitants used the caves. Today you can visit the caves either on tour or self guided. 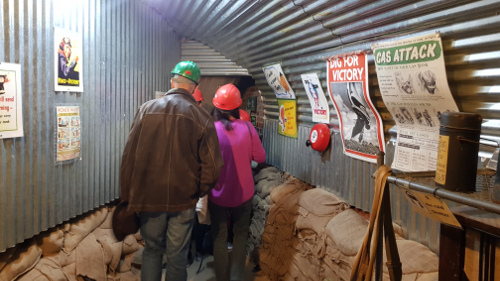 the tour lasts about an hour and is very informative so well worth booking into one. It seems that in the year 1492 the Butlers of Ormonde and the FitzGeralds of Kildare were rivals families locked in a longstanding dispute over who should be the Lord Deputy. No resolution was reached and in that year the dispute became violent and a small battle occurred outside Dublin city walls. The fight did not go well for the Butlers and so, realizing fortune had turned against them, they fled to St Patrick’s Cathedral where they took refuge. Their enemies pursued them to the cathedral and asked them to open the door and come out and agree to a peace. The Butlers did not believe that they could trust the Fitzgeralds and so refused to open the door as they feared they would be killed. So it was that Gerald FitzGerald asked for an axeman to chop a hole in the door. When this was done he pushed his hand through the door as a gesture of peace. The head of the Butler family took this as a sign of good faith and shook hands with Gerald. The fighting was over and peace restored. Here I am chancing my arm but Jane, my wife, did not have any weapons! 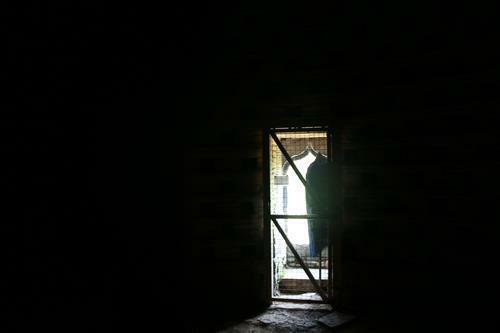 The door is known today as the “Door of Reconciliation”. It is believed then that this story was the origin of a commonly used Irish phrase “To chance your arm” or to take a risk. 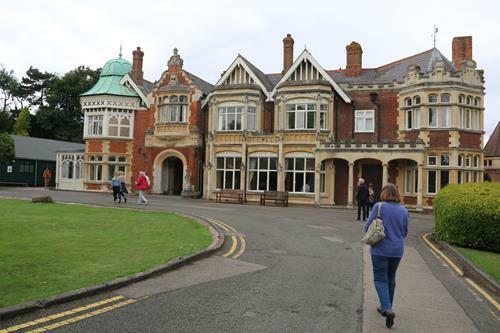 In July I paid a visit to the Bletchley Park Museum. During the war this housed the code breakers of the Government Code and Cypher School (GC&CS) which after the war became GCHQ. 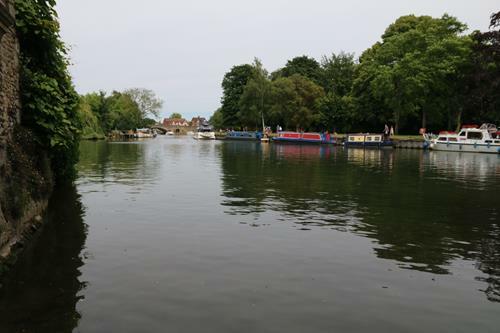 This was the place where the boffins who cracked the Enigma and Lorenz codes and other codes and cyphers worked in conditions of great secrecy. It also was home to scores of mainly female workers who ran the bombes that analysed the settings of Enigma, as well as translators who would convert the German messages (and other languages) into English, intelligence officers who would interpret the reports and many other specialists. Their story was not told until decades after the war. Yet their work may have been the single most important action in the war – saving countless lives and shortening the war by perhaps 2 years. It was here that the location of German U-boats were determined – helping win the Battle of the Atlantic. They were able to find out the targets of bombing raids, the locations of enemy units and even the progress of the V weapons projects. Their contribution to the planning of the land campaigns in Africa, Italy and Normandy was pivotal. This museum is a superb place to find out all about that. Several of the Huts are available to visit. Many have the offices setup as they were during the war. 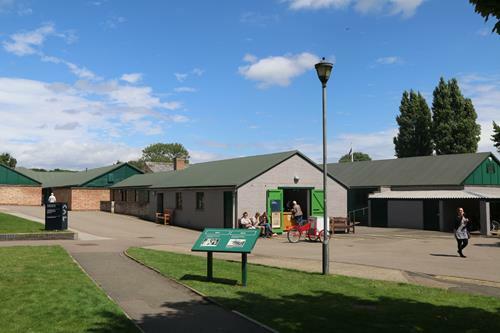 The museum occupies the very huts and Mansion the code breakers worked in. The different huts had different functions. 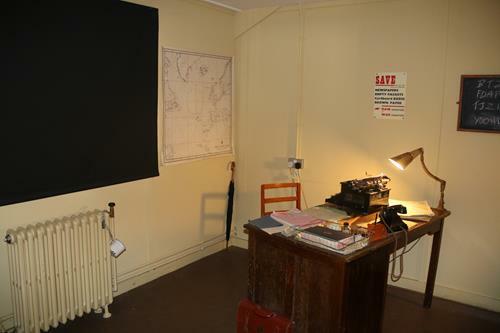 So those working in Hut 8 (like Alan Turing) invented methods and machines to be used to analyse the settings of the code machines, Hut 11 housed the bombes that they designed, Hut 6 actually deciphered the Enigma code and Hut 3 would then take the messages which were in German and translate them into English. (The messages being pushed between the two huts, along a wooden shut by a broom handle – such are the small details of such significant activities). Hut 4 housed analysts who worked out what the messages meant and their significance. The Mansion was the original house of the estate and the first part of the base to become operational when the government took it over. 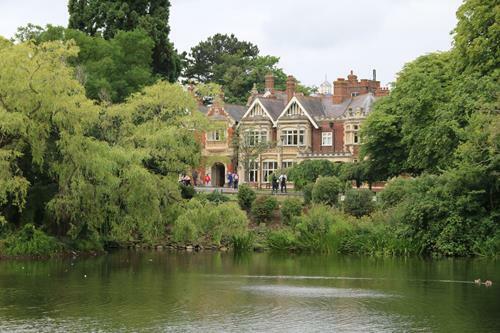 The lake and gardens of Bletchley Park became important as the code breakers would take breaks in the grounds and in the winter skate on the frozen lake. Unable to discuss their work the workers filled their free time with pursuits like concerts, dances, chess competitions, rugby games and dozens of other activities – many of the programmes and records of which still exist in an exhibit on life at the park.. The lake which would freeze over in the winter. 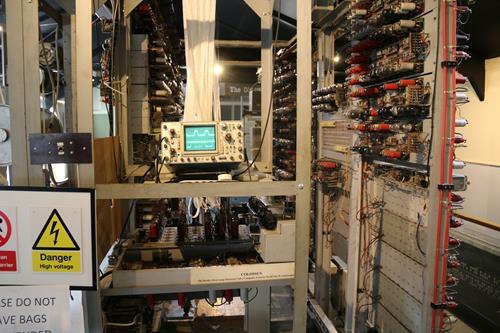 There were many codes and cyphers in use but two machines in particular became the focus of much of the activity at Bletchley Park. 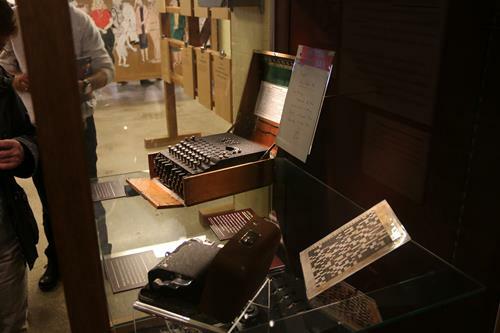 Enigma was used to send generally shorter messages like weather reports and orders to U-boats. An operator could type in a message, then scramble it by using three to five notched rotors, which displayed different letters of the alphabet. This would then be transmitted over wireless by simple morse code to a receiving station. The receiver needed to know the exact settings of these rotors in order to unscramble the text. Otherwise it was just a string of meaningless letters. These settings changed each day and with several wheels, in various orders with multiple ways of configuring each cog there were believed to be hundreds of trillions of combinations. Over the years the basic machine became more complicated as German code experts added plugs with electronic circuits. Breaking this code needed machines and humans to work together. The machines- called bombes could analyse possible settings and see if they were the right ones. Yet humans had to devise a short list of possible settings to test and that is where the genius of the code breakers came in. They would make a guess as what part of the message might be (Maybe “weather report Atlantic” )and then suggest settings that would work with that message. One of the bombes that could test Enigma settings. This one is an working replica at the museum. All the originals were destroyed. Lorenz was even more complicated than Enigma and was used for longer messages. It was sent by teleprinter and generated electronically. The Lorezne machines changed the text so anyone intercepting it would not understand it. 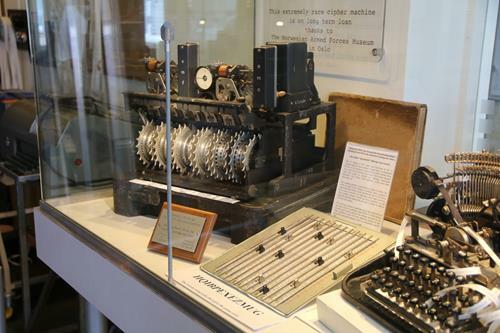 Analyzing the Lorenz machine settings required machines even more advanced than the bombes that cracked Enigma. 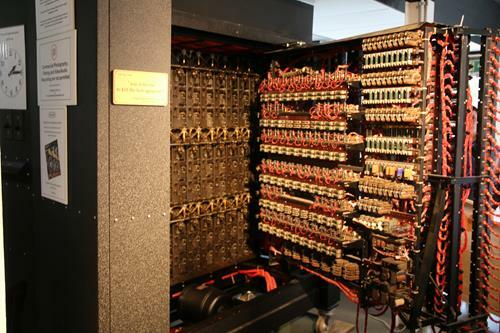 The earliest computers, called Colossus were actually developed to work out the Lorenz setting once a break through by an accademic called Bill Tutte was made. He worked out that the pattern used to scramble the text was actually a repeating cycle. There is a replica of Colossus in the adjacent National Museum of Computing which is work seeing to get the full picture. 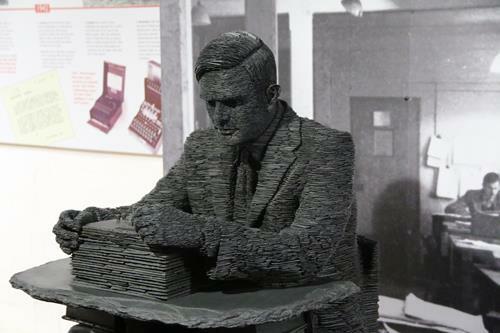 It is fascinating to consider how much he efforts in Bletchley kickstarted the whole computer revolution. You can also visit his office. Its amazing to be able to stand in the very place that Enigma was cracked. As with most of the offices it is pretty plain and simple. Many of the offices are created like this – often with videos of actors playing the roles of the code breakers and snippets of conversations can be heard in he rooms. The National Museum of Computing on the same site (not open every day) has working originals or replicas of the early computers (including Colossus) and the chance to try out the earliest computer games and do some coding if you can remember how to do it or ever could! 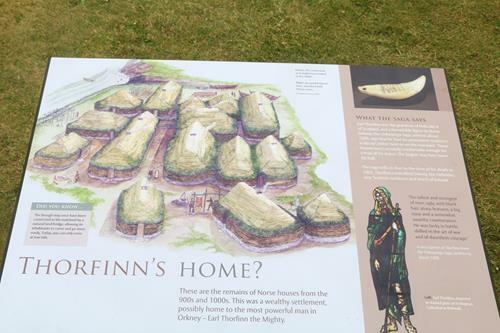 If you are looking to visit allow a full day for both sites. 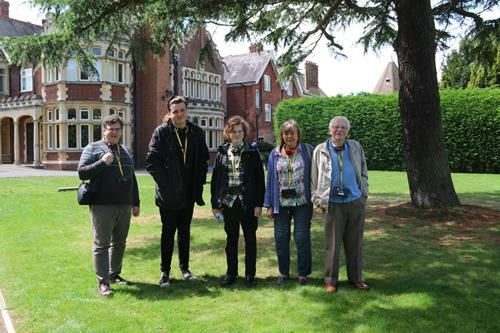 Find out more about Bletchley Park here. With the family outside the mansion. In the summer of 2016 I visited the Orkney Islands off the coast of Scotland. It is an archipelago teeming with historical sites of great significance. The summer in Orkney is not very long and many locations are not easy to get to apart from a few weeks in the year. Indeed one site that is quite restricted is the island called the Brough of Birsay which you can only visit between mid-June and the end of September. This windswept island was however once a focal point in the islands. 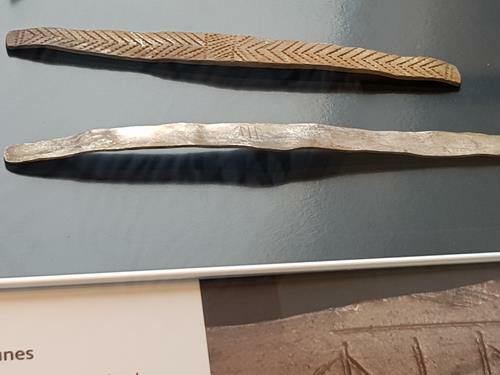 It features remains of both Pictish and Viking settlements and was perhaps even the capital of the Viking Earls such as Thorfinn ‘the Mighty’, Earl of Orkney. The words ‘brough’ and ‘birsay’ are very descriptive as they seem to derive from the Old Norse borg or ‘fort’. ‘Brough’ implies a naturally defensive island fortress. 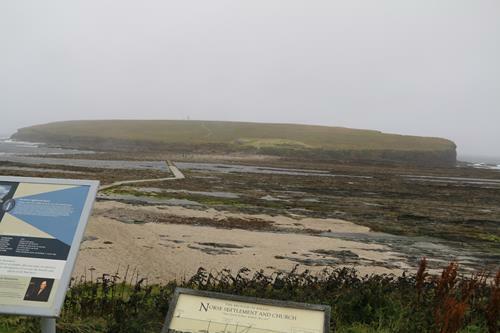 ‘Birsay’ relates to the fact it is only accessible by a narrow neck of land. 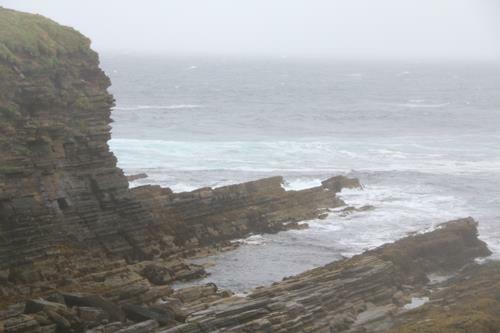 Today the Brough of Birsay is still a tidal island – connected to the mainland via a causeway. It is therefore important to check tide tables when visiting so as to not get cut off. Even during our hour or so on the island we noticed the sea rising quickly. I can also see why the island is only open at certain times of year. Even in August the weather can be mixed. Indeed the day we visited it was very windy and at times rather wet! Earl Thorfinn retained all his dominions to his dying day, and it is truly said that he. was the most powerful of all the Earls of the Orkneys. He obtained possession of eleven Earldoms in Scotland, all the Sudreyar (Hebrides), and a large territory in Ireland. … Earl Thorfinn was five winters old when Malcolm the King of Scots, his mother’s father, gave him the title of Earl, and after that he was Earl for seventy winters. He died towards the end of Harald Sigurdson’s reign. 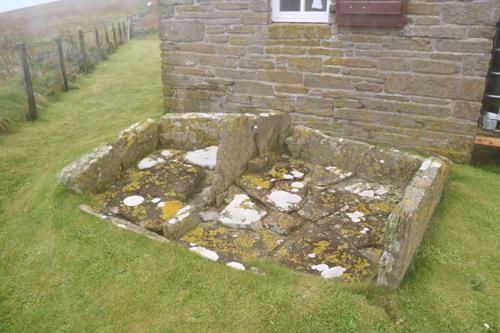 He is buried at Christ’s Kirk in Birgishrad (Birsay), which he had built. 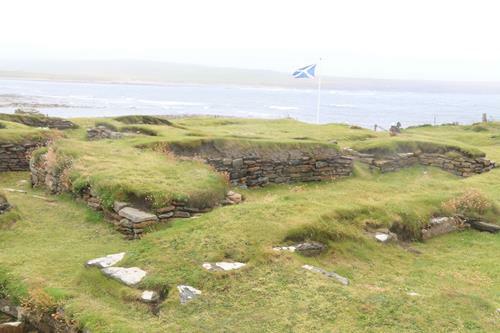 The Brough of Birsay was settled from the 7th to the 13th centuries AD. 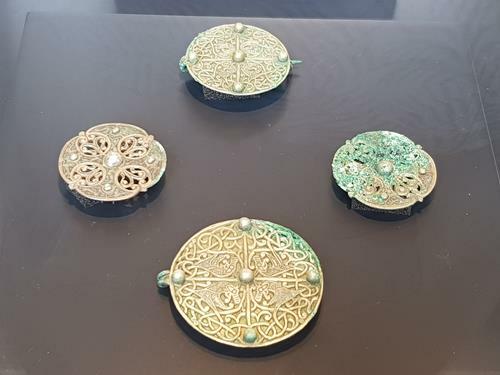 Today there are remains comprising of a 9th-century Viking-Age settlement as well as of the later 12th-century monastery and some evidence of the earlier pre Viking Pictish settlement of the 7th to 8th centuries. 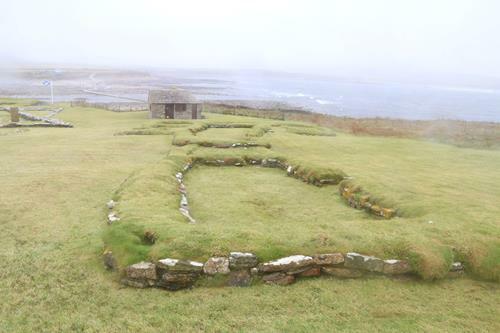 This is the hearth found in a Norse house towards the east side of the island and reconstructed at the main site. It is very easy to see the outlines and foundations of a dozen or so houses – some with multiple interior rooms. 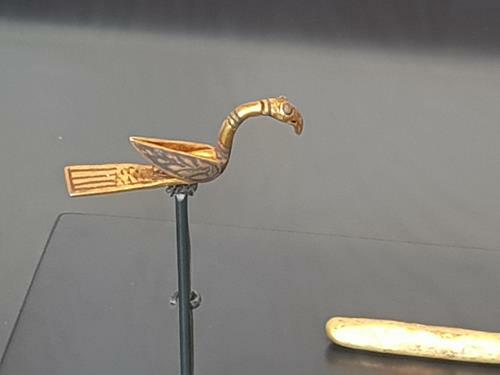 The Vikings here had some home comforts. There is even evidence of under floor heating and a smithy. 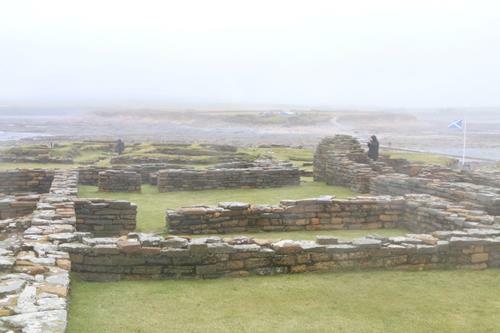 Birsay’s glory days of the 11th century soon passed however when the focal point of the Island shifted to Kirwall where the cathedral of St Magnus took over as the religious seat for the island in the 12th century. 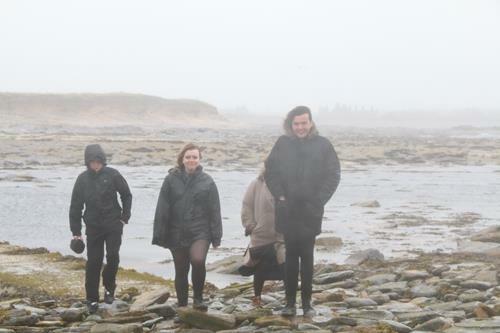 Today Birsay remains a beautiful, striking location that was fun to visit – even on wet and windy day. On a recent trip to Evesham I stopped at this National Trust Property. 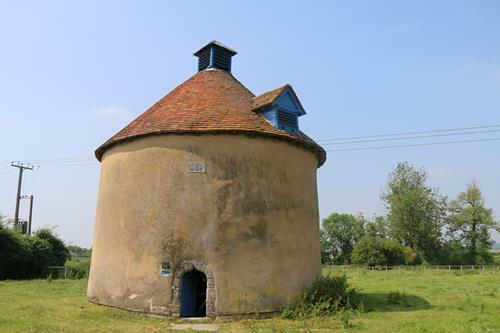 The Kinwarton Dovecote is a (fairly rare in the UK) surviving circular 14th-century dovecote situated in Kinwarton, near Alcester in Warwickshire. The dovecot is the only remaining structure from a moated grange that belonged to the Abbey of Evesham, which was close by. 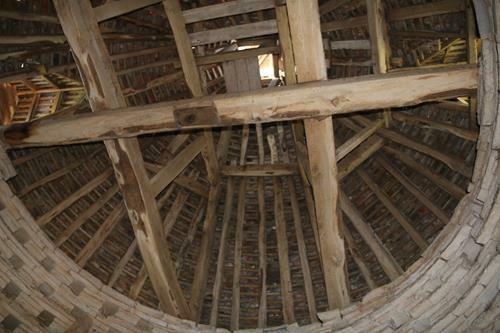 The right to own and use a dovecot was a perk of being a Lord of the Manor. 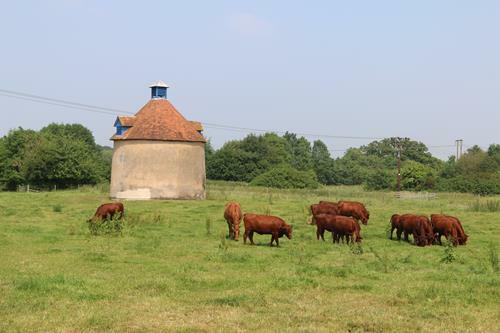 There is evidence of a certain Robert Green gifting a dovecote to Abbot William de Boys of Evesham. There is no specific evidence that this is that dovecot but its the right age so it could well be. The dating of the dovecot is based on the style of the doorway which is called a ‘ogee’ arch which have a sort of double S shape. The walls which are over 3 feet thick are built of rubble with plaster rendering. 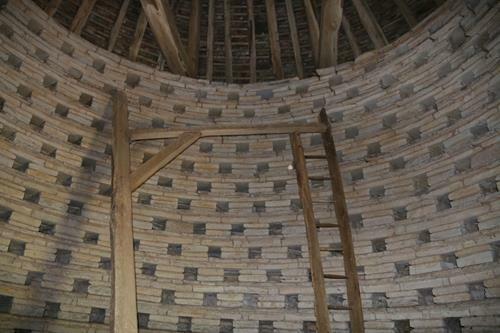 The interior is lined with over 580 nesting boxes arranged in 17 layers. Access to the boxes was made possible due to the installation of a ‘potence’; a ladder which is made to pivot around a central post. Above you can see the timbered roof and below an idea of the thickness of the walls can be gauged from this shot of the door way from inside the dovecot. For more information visit the National Trust Site. Yesterday I had reason to be driving to Evesham in Worcestershire. 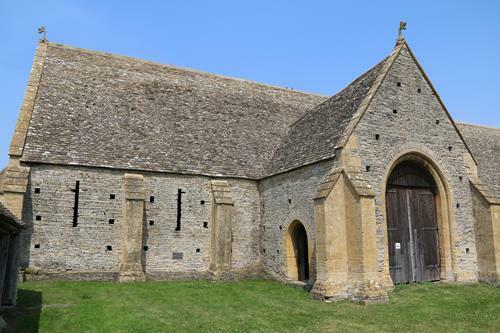 having an hour or so to spare I decided to visit Middle Littleton Tithe Barn which is a National Trust Property in a small village near Evesham. 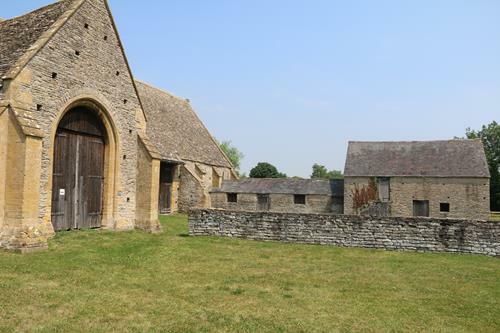 A tithe barn was a type of barn used commonly across most of northern Europe in the Middle Ages for storing rents and tithes. The tithe was paid by the villagers and farmers around a village and represented one tenth of a villagers income or a farm’s produce. As such the bulk of the tithe would be paid in the form of food or drink. 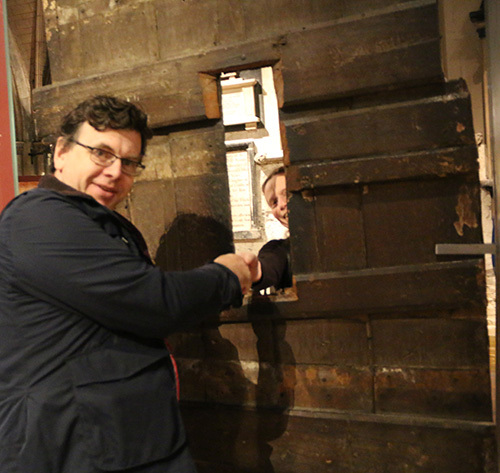 The tithe was was given to the Church to help maintain the local church. In exchange the locals received spiritual care, healing and education. 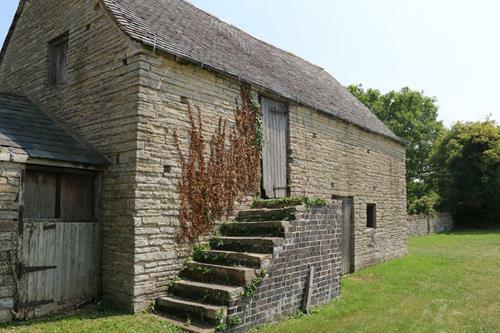 Tithe barns were built to store all this produce and was often close to the village church. 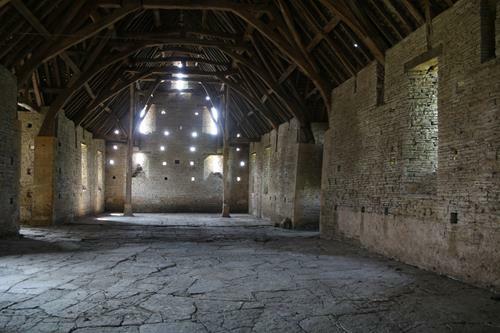 One of the largest and finest 13th-century tithe barns in the country is Middle Littleton Tithe Barn. 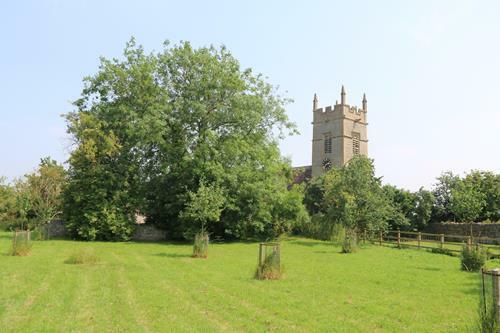 It was once part of a more extensive estate consisting of a Manor House, Church and surrounding farms and fields. 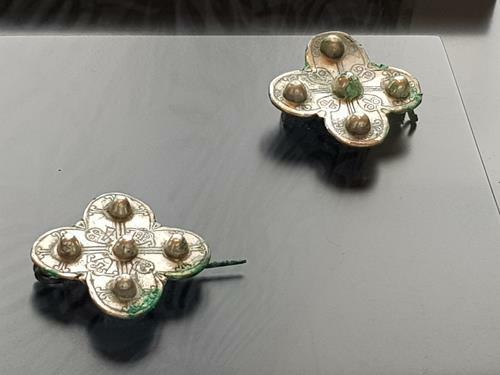 It is believed to date to circa 1250. This out house once housed a cider press and behind it there is still an orchard between the Tithe Barn and the local church. 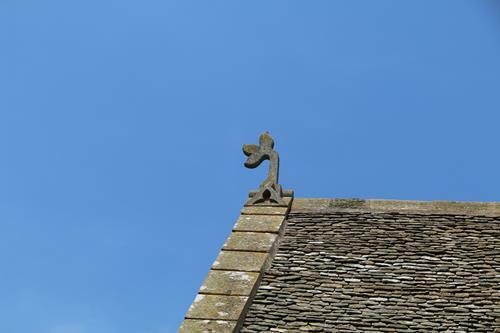 Upon the roof of the Tithe Barn is a Finial which was not just decorative but believed to keep away evil spirits. The interior is a huge space. 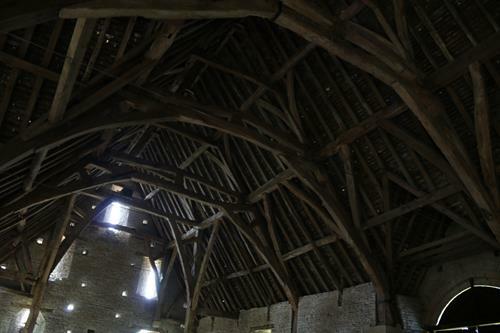 the roof is supported by what is called a raised cruck roof.